To make a little more profit from the castings, Corgi extended their Monte Carlo Rally sequence of cars with two more ‘Imps’, #328 and #340. The latter was really a Sunbeam Stiletto but it is called a Sunbeam Imp. This is #328 and is the same baseplate as #251 with two jewels added at the front and No. 107 and some decals. 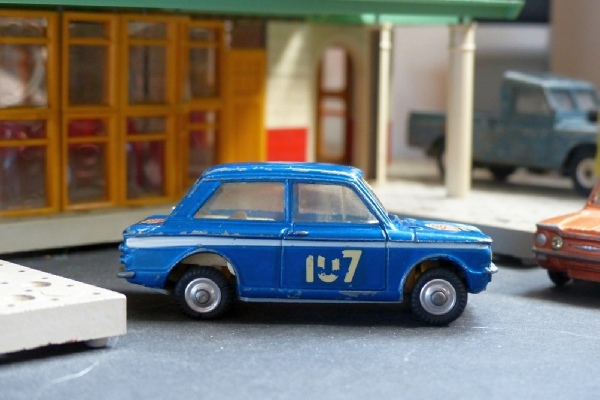 All these models are dark metallic blue with a cream interior, markedly different to the brighter blue and yellow of the normal saloon version. The rear window opens and the rear seat can be folded down. I can just hear the conversation in the Corgi Board Room. This is a nice example with a few bits of paint missing on the roof corners and edges and, whilst the suspension is good front and back, the rear nearside is not as firm as the offside so there is a slight lean to one side. Not at all bad, though, as on most the suspension has completely failed.